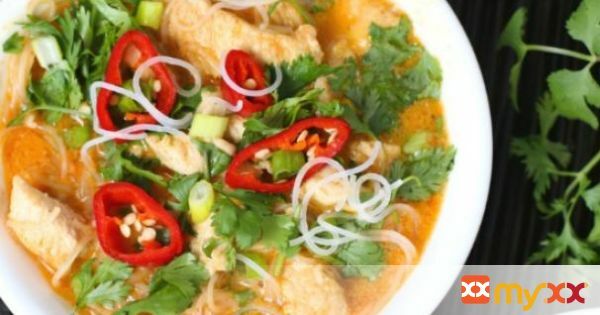 4 Ingredient Red Curry Chicken with noodles is easy, quick and inexpensive to make. Sweetened with coconut milk for unbelievable flavor! 1. Heat the oil in a large skillet on high heat. 2. Quickly brown the chicken cubes for 2 minutes on each side. 3. Lower the heat to medium high and add the curry sauce and coconut cream. Let cook for 5 minutes. 4. While the chicken is cooking, boil the rice noodles according to the directions on the package (mine only took 3 minutes). 5. Drain the noodles and set aside. 6. When the chicken is fully cooked (165° Fahrenheit), lower the heat to simmer. 7. Add the rice noodles and let simmer for 5 minutes. Divide amongst bowls and top with toppings, if desired.